What, when it comes down to it, has technology truly been good for when it comes to Egypt's political resistance? Several speakers during a mid-day session at PdF '11 took up that question, and in the aggregate pointed to the idea that it's been "good" in myriad ways far more complex, and interesting, than any reductive notion of a quote-unquote Facebook revolution captures. "Technology offered a perfect medium to build a narrative about revolution," said Alaa adb el Fattah, an Egyptian blogger, technologist, and activist who runs a blog hub called Manalaa. That narrative? That whatever grieved Egyptians was the result of the Egyptian regime. No job? It was the regime's fault. Bad wages? It was the regime. Police brutality? The regime. Online, resistors were able to slowly build that storyline to a critical mass, while robbing the regime of the tangible targets of factors, universities, and houses of worship that had been the focal points of other organizing efforts. That digital cohesion, to borrow a phrase from fellow presenter Jillian York of the Electronic Frontier Foundation, bought Egyptians angry about the state of their state some time and space. "We did it without having to completely liberate a single space," said Fattah. "Because when we tried to liberate a single space," in the past, "we got the full might of the state." And through horrible circumstances, the resistors' efforts gained a particularly focusing idea in the form of Khaled Said, a young Egyptian killed in Alexandria a year ago today in while in police custody. The "We Are All Khaled Said" Facebook group was particularly powerful, said Egyptian-American journalist Mona Eltahawy, because of the face that connected Egyptians found staring back at them. 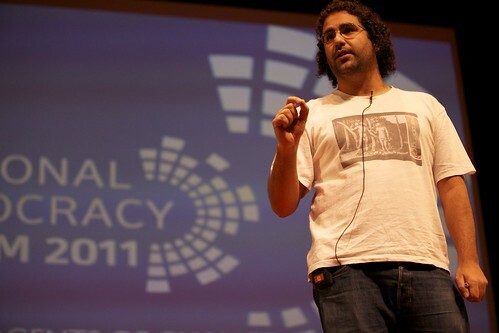 "He was someone who looked like everyone on Facebook," said Eltahawy. "He looked like I look." Dr. Rasha Abdulla, chair of the journalism and mass communications department at the American University in Cairo, railed against the Egyptian regime's response to the organizing that found digital communications cut off at the height of the revolution. "People died when the Internet was blocked," said Abdulla. "People died when the Internet was blocked." Abdulla called on the international community to treat such network severings as a criminal offense. Of course, technology comes in all shapes, sizes, and forms. Fattah asked the crowd what the most important technology was in the Tahrir Square protests. Facebook? Maybe Twitter? "Rocks and clubs," he answered to laughs. There was even some interest, he said, in using that ancient technology the catapult during those Cairo conflicts. "Of course, we got the designs and the plans over the Internet."